It’s not every day that you get to taste a wine of which only 90 cases were produced. This wine was a gift from a friend. Alcohol by volume is 14.9 (website says 14.7) but who’s counting…? Our weather had turned a little cooler from the prior day when we had temperatures in the upper 70’s…a virtual heat wave for the East Bay area! With the cooler temperatures, it was time to pull out a red from the cellar. It had been a while since I tasted a Zinfandel and I thought “Why not drink a nice red before the weather creeps back up into the upper 70’s?” The weather channel was saying soon, so I pulled a Zin out of the cellar. 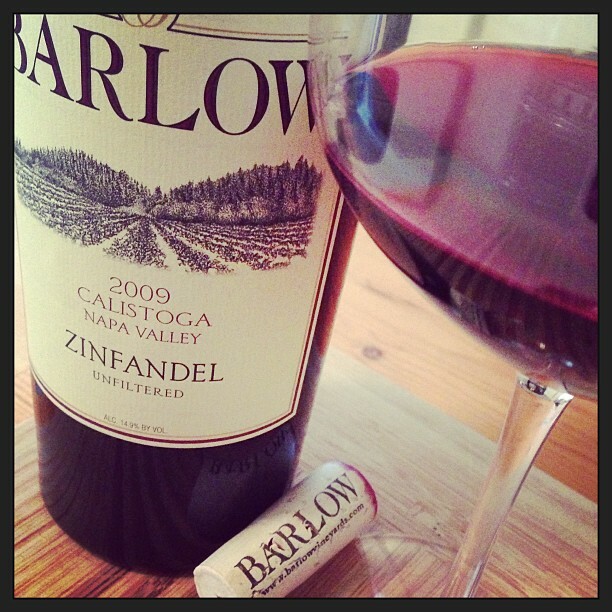 After posting a photo of the Barlow Zinfandel as “In my glass tonight…” I received several positive comments so I knew I was on the right track. I took my glass, swirled it and took a nice big sniff…mmmm, nice dark fruit on the nose with a layers of plum and raspberry and a hint of spice. First sip, those aromas also showed up on the palate. The dark berries, plum and raspberry were complemented by a subtle vanilla, spice, soft tannins, and a nice finish. While it was a great compliment to the left-over grilled chicken, I thoroughly enjoyed a glass of the Barlow Zin on its own as I relaxed after dinner. I love these small productions, where just the idea of having something that is only available in minuscule amounts is there just for you. Awesome. Thanks…I do too. Always love helping the small business guys out!!! And besides that, you can find some fantastic wines that no one hears about. Exactly. It is both: helping the smaller guys and having a unique experience. Both benefit.